Pete Wishart (Perth and North Perthshire) (SNP): I refer the House to my entry in the Register of Members’ Financial Interests, which relates to royalties received from works recorded prior to becoming a Member of this House, and on which I work zero hours. There is one recording not in the register: the record by MP4, the cross-party parliamentary group, which has made almost £1 million for charity in the past 10 years. I know you have a certain affection for the recordings of MP4, Mr Speaker, and we greatly appreciate that. Here we go again. Just when we think that the Westminster establishment could not be held in lower esteem by the public, something comes along to disabuse us of that notion. It is all so familiar: a sting operation by the media using a fake company involving some of our senior Members of Parliament and the lure of access. Underpinning it all is the possibility of cash in the hands of those Members. Mr Mike Weir (Angus) (SNP): My hon. Friend talks about cash. Does he not find it strange—it seems strange to me—that it is so simple to entrap people in this place with the lure of cash? Members do not even take simple steps to find out if these people are genuine. Pete Wishart: My hon. Friend makes a very good point. The right hon. Member for Blackburn (Mr Straw) made that very same observation about an almost identical sting prior to the last election, when it was then Labour Cabinet members who were caught up in a rotten affair. The public observe this House with something approaching bemused bewilderment, concluding that the Westminster Parliament exists as little more than a self-serving institution for its overpaid Members. This Parliament has never been held in such contempt. Never has there been such a profound alienation between those who are governed and those who occupy the corridors of power. There is a massive disconnect between this House and the people of Britain. All that has happened in the past week makes that disconnect even wider. People will observe the comments from Conservative Members with something approaching disbelief. We see that reflected in how the public respond to this House—of course we do. The two major establishment parties can barely get above 60% in the polls. The public are not prepared to accept this anymore. Graham Jones: Perhaps the hon. Gentleman could tell the House how many Scottish National party MSPs who are standing in the general election intend to stand down as MSPs, or will they be dual-hatted? Pete Wishart: I know one, and yes he will. This House is able to secure only 60% of popular support. That suggests to me that the people of these islands are looking for something different. They are sick and tired of the antics of this particular House. That is reflected in how they are responding to the way the Westminster establishment parties do their business. They are sick and tired of the self-justification: the special pleading; the bleating; the idea that somehow this House is enriched because Conservative Members can make some extra money; that this House is enriched because they bring outside experience to it; and that we cannot live on £67,000 a year. Tell that to our constituents! That is treble the national average wage. Our constituents are currently suffering austerity and a diminution of their annual income. They are experiencing real poverty and real difficulty, yet this House tells them that right hon. and hon. Members cannot get by on £67,000 a year. I believe that being a Member of Parliament is a full-time job. In fact, we have got two jobs: we have our responsibilities in this House, and then we have our obligations to our constituents. Becoming a constituency Member of Parliament has changed dramatically in the 14 years that I have been here. It has become much more technical and much more complicated, with a greater amount of different tasks and skills needing to be acquired to serve members of the public efficiently and effectively. The suggestion that this can be combined with a second job with outside earnings is something I believe our constituents would find very difficult to accept. Sandra Osborne (Ayr, Carrick and Cumnock) (Lab): Will the hon. Gentleman give way? 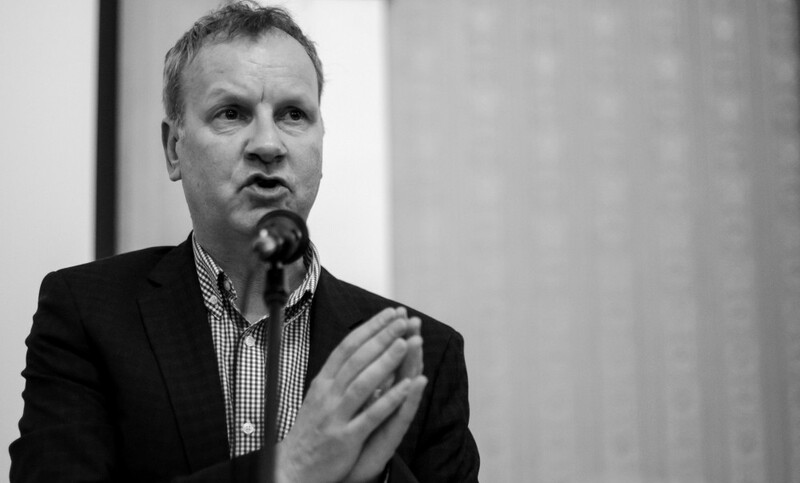 Pete Wishart: I cannot; I have no more time left. No SNP Member has a second job, a directorship or a place on a company. Our responsibilities here are our sole concern and our only responsibility. SNP Members serve our constituents and ensure that the agenda for the nation is progressed. That is what we do when we come here. It is only this House among the Parliaments and legislatures of this nation that seems to have this difficulty. 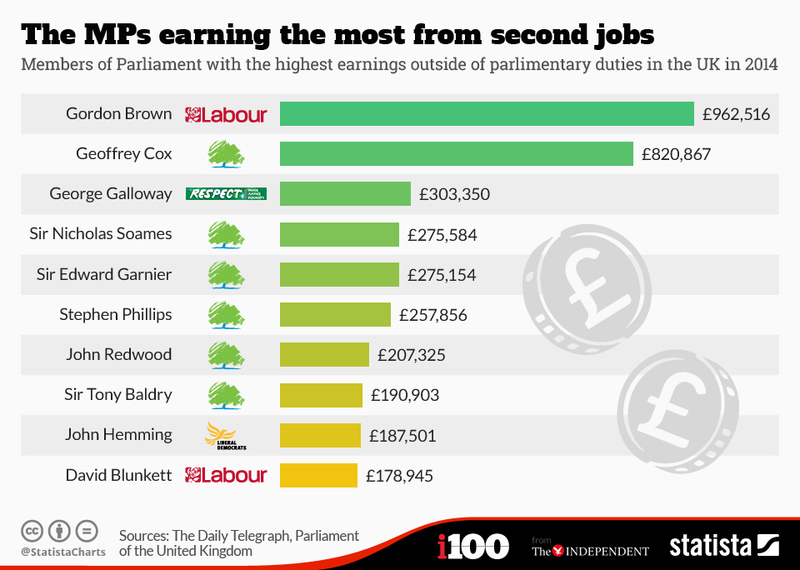 It is only at Westminster where there is an issue about paid directorships and second jobs. We certainly do not have such issues in the Scottish Parliament, and I do not believe they have them in the Northern Ireland Assembly or the Welsh Assembly. I believe that there is something peculiar and particular about this House. It has something to do with the history and the culture, something to do with the sense of entitlement that almost seems to come out of the pores of this place—the idea that people came to this Chamber because it was something for them to do after their main job. 25 Feb 2015 : Column 407 John Cryer (Leyton and Wanstead) (Lab): Will the hon. Gentleman give way? Pete Wishart: I have no time to give way. That is what we see with this particular House. It is built into the culture and the history. We need a 21st-century institution that is equipped to deal with the Britain we currently serve. It is no good relying on these old ways of doing things; we need to look carefully and clearly at how we conduct our business. What the public are seeing is cash for access and cash for honours. The public are looking at that absurd, ridiculous place down the corridor, with 850 ermine-clad unelected Lords. That is what they are seeing in this rotten democracy. We have a task to do if we are to ensure that we clean up this House. I will support the Labour motion, but I observe that a number of Labour Members are among the top earners when it comes to outside interests. I would say to the Labour party, “If you are sincere, do it from next week.” I really hope it goes through with this and can maintain it as a policy. We owe it to our constituents to try to ensure that we do better. We are not part-time Members of Parliament. Looking after our constituents is a full-time job. A second job means a second master, and that second master expects something back in return. Let us make sure that we do this job exclusively on behalf of our constituents. There should be no second jobs, no paid directorships, no outside interests with a financial return. Let us work for our constituents and make them our only priority. This entry was posted in Uncategorized on February 26, 2015 by petewishart. Those of us of a nationalist persuasion have been enjoying immensely Scottish Labour’s excruciating policy contortions as they desperately try and get a bit of traction into their moribund election campaign. There is absolutely no doubt that there is a new frenetic energy in Scottish Labour and there seems to be no limits to the almost daily policy ‘adaptions’. From picking a fight with London, to re-introducing booze at the fitba’, Labour are currently like a hyperactive duracell bunny on stimulants. Whilst all of this is incredibly good fun to observe, we have to ask if any of it might actually be working? Labour has famously targeted Glasgow ‘man’. This is the former Labour voter in West Central Scotland who voted Yes and who probably also voted SNP in Scottish Parliament elections. Labour have identified 190 000 or so of these voters who now have to be lured back if Labour is to hold on to their seats in the General Election. The problem for Labour is that Glasgow ‘man’ remains singularly unimpressed with what he observes and has several unresolved issues with the ‘man’ from Scottish Labour. Chief amongst them is the company that Labour has been keeping. The two year association with the Tories is not so easily dismissed by the waving of a flag and the unimpressive declaration of patriotism. 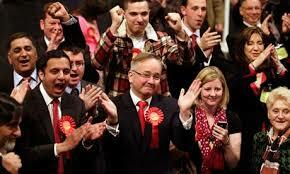 Glasgow ‘man’ heard the ‘man’ from Labour describing his political ambitions as a ‘curse’, or a ‘virus’. He was also labelled a ‘separatist’ (and worse) from those who now seek to enlist his support to save their careers. If Glasgow ‘man’ was of a mind to perhaps forgive Scottish Labour for this as a referendum ‘thing’, he would quickly be disabused of the notion by witnessing the ‘men’ and the ‘lassies’ from Labour voting with those self-same Tories on further austerity, a welfare cap and £100 billion of Trident renewal. Glasgow ‘man’ might just be thinking that the ‘man’ from Scottish Labour increasingly bears little difference to their former colleagues – the ‘gentlemen’ from the Tories. Labour’s problem isn’t going to be addressed by the almost nonsensical policy stunts. It is only going to be addressed with a fundamental look at the space it currently occupies. A new political era is emerging and there is a real sense that the Labour/Tory neo-liberalism that has characterised our politics for the past decades is coming to an end. Scottish Labour, like its UK head office, still seems to be very much attached to the old orthodoxies and the maintenance of a ‘more of the same’ Westminster establishment austerity hegemony. Where Scottish Labour tries to breathe life into a politics on its death bed, Glasgow ‘man’ has already moved on. I don’t know if Labour will find the message to lure Glasgow ‘man’ back to its paternalistic bosom, but we must continue to provide him and the rest of our fellow Scots with hope and a new challenge to old ways of doing things. Labour, as ever, still seems to be picking the wrong fight with the wrong range of armoury and will probably only end up shooting themselves in the foot once again. Meanwhile Glasgow ‘man’ seems to be perfectly happy with his new home and we should give him everything he needs to sustain himself. This entry was posted in Uncategorized on February 23, 2015 by petewishart. When I was fighting my first election campaign, a dreadful accident happened in what would become my constituency of North Tayside. Three generations of Israeli tourists were killed in their car at the Ballinluig junction after becoming confused trying to navigate the dangerous A9. I then made it my mission that I would do all I could to make this road safe. Since then, we have improved the Ballinluig junction and the A9 is to be dualled from Perth to Inverness. But these projects take time, as communities are properly consulted and all the necessary engineering works are conducted. In the meantime, this road continued to take lives. That’s why it was decided that more needed to be done right now. 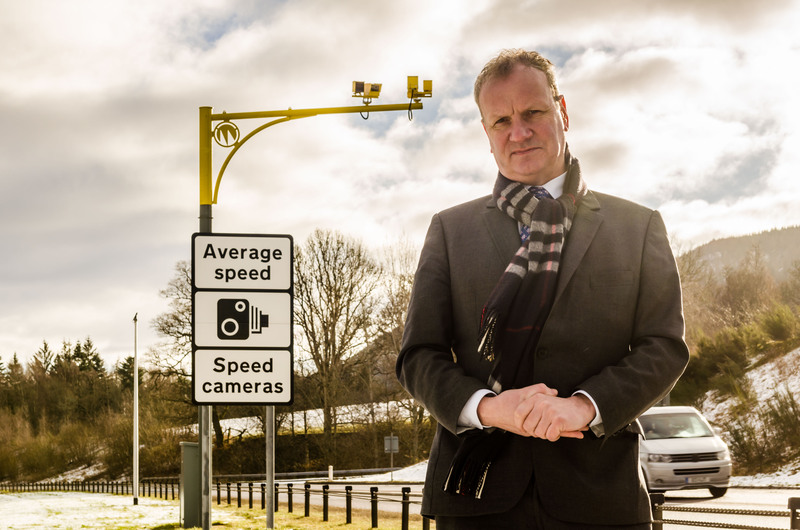 The Scottish Government looked at the example of average speed cameras and the impressive impact that they had on changing driver behaviour, not just in Scotland, but across Europe. A trial was then approved that would enforce the existing speed limit of 60MPH on single carriageway and 70MPH on dual carriageway, but also raise the speed limit for HGVs to 50MPH to reduce the speed differentials between cars and the many heavy vehicles that use this road. The success of this measure has been overwhelming. Speeding is down and speed-related accidents have been more or less eliminated. More than that, the experience for the travelling public has been massively improved. On the A9, there is no more fretfully looking in the rear-view mirror wondering when the next car travelling at 85MPH might be coming your way whilst overtaking a convoy of lorries. The road has been simply transformed. Not everyone agrees though. I share an almost equal length of the A9 with the Chief Secretary to the Treasury, Inverness MP, Danny Alexander. He has been campaigning hard to have these cameras taken down. He has been watching the polls with great anxiety and thought that a lazy populist campaign on the cameras might address his dire electoral prospects. When the safety statistics came through, I asked him to stop his reckless campaign and he refused. We, therefore, have a UK Secretary of State campaigning to put the people of Perthshire at risk once again and wanting the right for motorists to speed unhampered. The cameras might not solve all the issues on the A9, but they have made people feel more safe and secure. I will never forget the sickening feeling when the news of that family came through that day 15 years ago and that is why I will support any measure that helps make such accidents on the A9 a thing of the past. This entry was posted in Perthshire Advertiser on February 6, 2015 by petewishart.